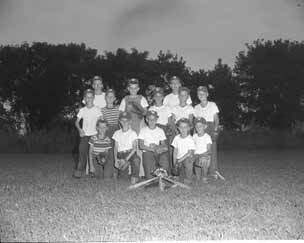 The Norling Family Photo Collection chronicles life in the Bloomington community during the transition from agrarian society to suburbia. 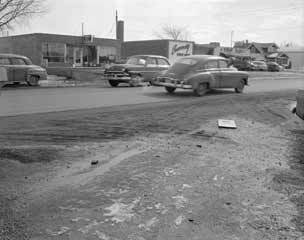 The Irwin (Irv) Norling photo exhibit displays some of over 10,000 photos that the Norling Family took of Bloomington, Minnesota, from the 1950s to the 1980s. Irv Norling and his family captured the everyday life of the community, commemorating life's many celebrations. Photographs include weddings, confirmations, Lions Club rodeos, Bloomington mayors and councils, school constructions, dedications, events, Girls Scouts, Boys Scouts, Shriners pancake breakfasts, the Bloomington Athletic Association, parades, the Millers baseball games at Met Stadium, Marvin Anderson ramblers, development from the east to west side of the city, the opening of I-35W ...anything and everything that was Bloomington. The Bloomington Historical Society is proud to be the repository for the significant Norling Collection. The society assigned the archiving of the collection a high priority, consulting with specialists from the Minnesota Historical Society, photo conservators and curators. Normandale Community College history professors and students assisted in the collaboration of service-learning-oriented projects. 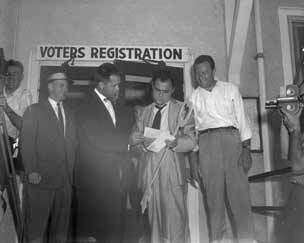 Over 160 students participated in the scanning of the approximately 10,000 negatives and 2,500 photos in the collection. Featured at the Minnesota History Center in St. Paul from April 1 through June 15, 2008, the exhibit is a collaboration of the Minnesota Historical Society and the Bloomington Historical Society. The exhibit was a companion to the book Suburban World by journalist Brad Zellar who was inspired by Norling's images. The exhibit is now in the permanent collection of the Bloomington Historical Society. For further information, call 952-881-4114 or 952-881-4327. 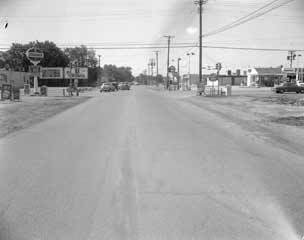 The following are samples of Norling's view of suburban Bloomington in the mid-twentieth century. Mike Todd in Bloomington. Mike was a Hollywood Producer who was married to Elizabeth Taylor. 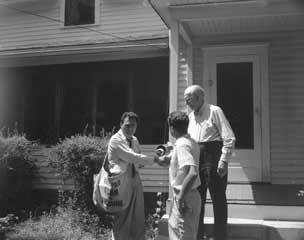 In this photo, Mike is delivering a paper to the house he grew up in, located on the former Cal’s Market site. 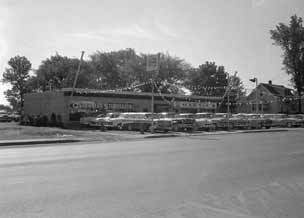 Mike’s father ran the Garden Store at the site of the old Baillif store at 102nd and Penn Avenue South. Mike Todd was given key to the Town of Bloomington by Mayor Gordon Miklethun. They are standing on the steps of the Bloomington Town Hall, which served as the town offices. 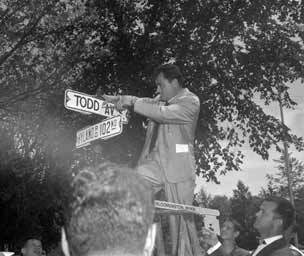 The town named a street after Mike Todd (for a day) at the intersection of 102nd and Hyland. Mike was killed in a plane crash some time later. Lyndale Avenue looking North from 100 feet north of 98th Street. Community State Bank, looking SE from the west side of Lyndale Avenue. Opening of the Southtown Shopping Center at 79th and Penn Avenue, with Montgomery Wards as an anchor. Located on 200 acres, the one million square foot Mall was the first regional shopping center to serve Bloomington. 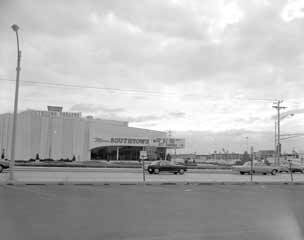 Southtown Theater at I-494 and Penn Avenue. Osterberg Studebaker Dealer at 93-94th and Lyndale was one of many car dealerships to locate here. 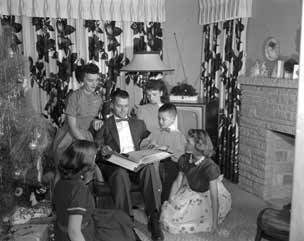 Mayor Gordon Miklethun with family during holidays. 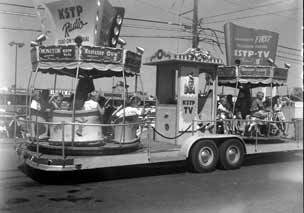 Centennial parade, showing KSTP vehicle. 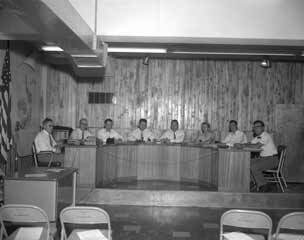 KSTP filmed many of Bloomington’s events over time. Herman Kossow with Ms. Bloomington. 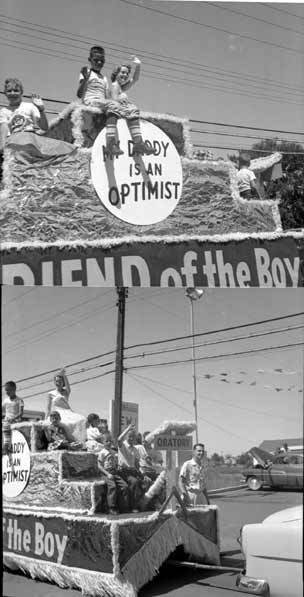 Bloomington Optimist float in Centennial Parade. 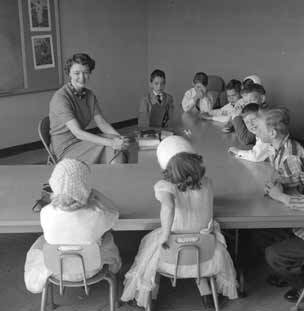 Sunday school class at St. Patrick's. 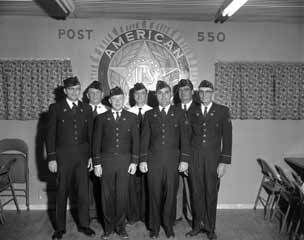 American Legion Post 550 Commanders at Post 550. 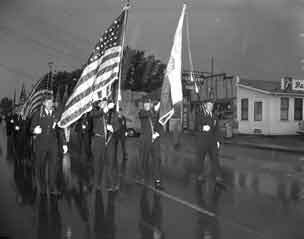 Everett R. McClay Post 1296 parade color guard. Lions Club Rode prize show horse (winner) with child wondering if he should get on the horse. 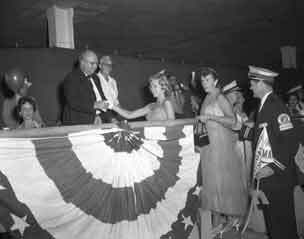 The Lions Club and other civic organizations were active in sponsoring many special events over the years throughout the Bloomington community. 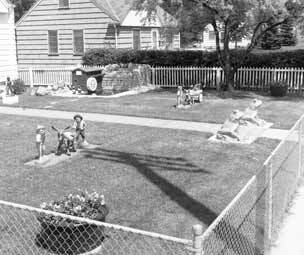 Ray Fleischman house, 7408 Nicollet Avenue, portrays suburbia--the house in the suburbs with a picket fence. Excavation for sewer and water mains in Bloomington. 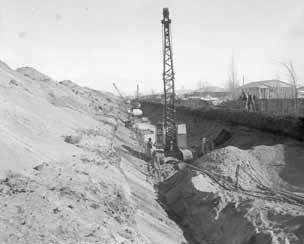 The project earned Bloomington the All-America City Award in 1961. Bloomington school buses lined up, ready to transport the rapidly growing numbers of schoolchildren. 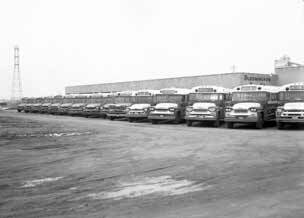 The buses were owned by the George Knapp Bus Company. 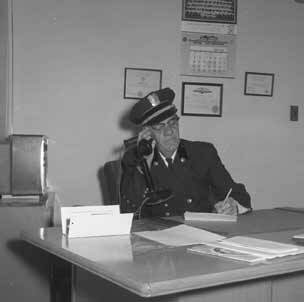 Cy Johnson, Richfield Police Chief, at his desk. 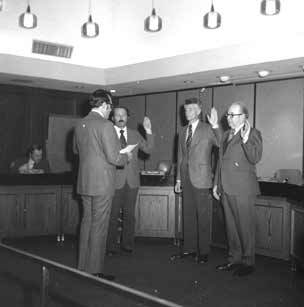 Bob Benedict being sworn in as Mayor of the City of Bloomington. 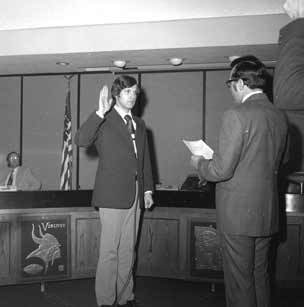 He was the younest Mayor to serve Bloomington, before or since his term. City Clerk Al Bremecker gave the Oath of Office. Oath of Office being given to City Councilmen Bill Belanger and Robert Darr and to Mayor Bob Benedict. John Pidgeon and Robert Hoffman at Council meeting. 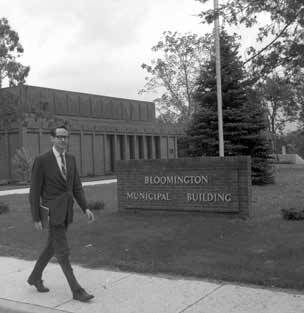 The new Bloomington Municipal Building with Harold Nelson (Harold's election photo). 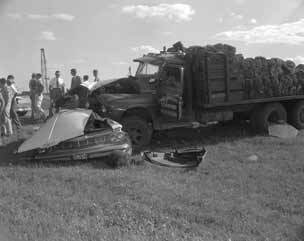 Accident at 78th and Normandale between Donley & Johnson sod delivery truck and passenger vehicle. Irv Norling had police scanners in his car, by his desk at work and by his bed. He rushed off to all police and fire calls to record the event. When he was not available, his family took the photos. Fatal accident at I-494 exit and E. Bush Lake Road. 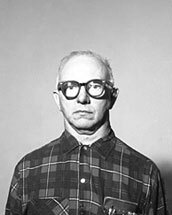 Irv Norling’s photos were used for investigative purposes by the Bloomington Police Department. BAA Giants baseball team playing at Toro field. 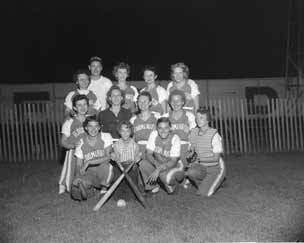 The Bloomington Athletic Association is regarded as an outstanding example of the youth sports programs throughout the nation. The program has attracted many thousands of youth participants and many thousands of volunteer parent coaches and other volunteers who assisted. 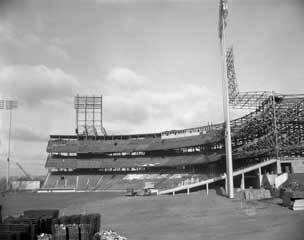 Metropolitan Stadium under construction. The Met opened in 1956 for the triple-A Minneapolis Millers and was home to the Minnesota Twins, the Minnesota Vikings and the Minnesota Kicks. The stadium was also the site of numerous concerts and other events. 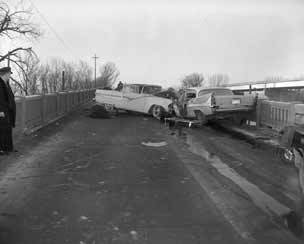 It was a common ground for millions of Upper Midwesterners, an integral part of life in Twin Cities. Demolition of the Met began on January 29, 1985. 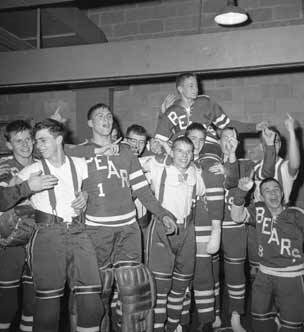 Bloomington High School Bears hockey team at winning game. Walsh's Women's softball team and winning champs. 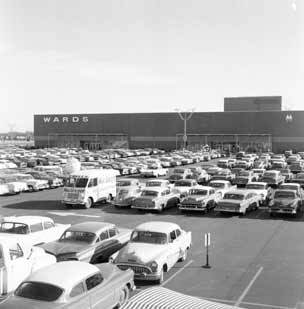 Walsh's Grocery Store was a popular place for Bloomington families to shop. 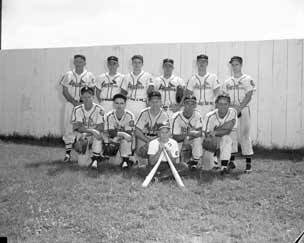 Red Birds men's baseball team. 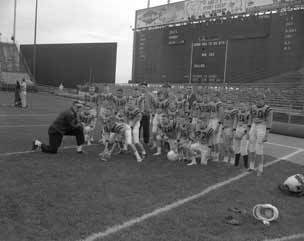 Arnie Johnson with Bloomington Athletic Association (BAA) football team at Met Stadium. Arnie is known as the "Father" of BAA boys sports. - Betty Lokken as the "Mother" of BAA girls sports. 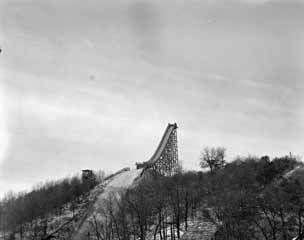 The Norling Photo Collection is a copyright of the Bloomington Historical Society. These photos shall not be used for publication without prior contractual arrangements with the Bloomington Historical Society. Permission must be requested for use on the Internet to institute procedures to prohibit printing or sales of the photos via the Internet or by any other means. 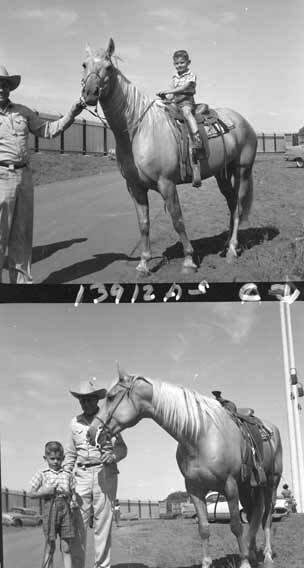 For information about the Collection or use of photographs, contact 952-881-4327. Comments by Vonda Kelly, President and Executive Director, Bloomington Historical Society.